A Pump Track at Victor Harbor – coming in May-June 2019! From the early stages of riding a balance bike or scooter to the “hard to entertain” age of tweens and teenagers (and the adults who never grow up!) a Modular Pumptrack is brilliant fun for all ages. So….be sure to bring your bikes, scooters, skateboards or blades and test out our new 48-metre long track. Hours of fun for the whole family. A pump track is a circuit of turns and features designed to be ridden by ‘pumping’ – which means creating momentum and movement by body motions that are up and down. 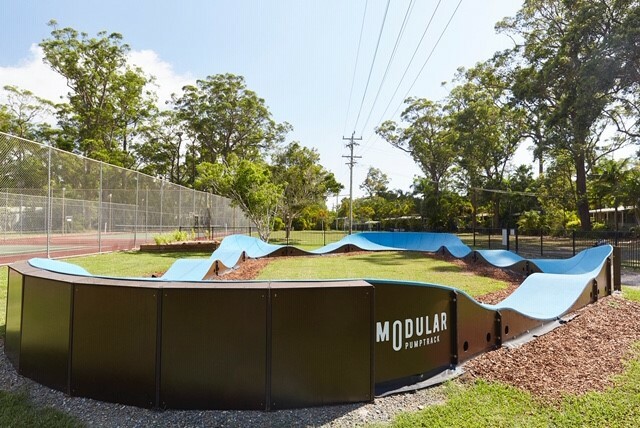 Our pump track from Modular Pumptrack is an award-winning, environmentally-friendly product renowned by world riding champions for its ‘riding flow’ which makes this a safe yet challenging and enjoyable track for all ages and abilities. It could be the most fun you’ve EVER had on your bike, scooter, skateboard or blades! Want to know when the Pump Track is up and running? Keep your eyes on our Facebook page for notification of opening dates as soon as we know more.